How Far is The Bhagwati CGHS? The Bhagwati CGHS is one of the residential developments of The Bhagwati CGHS. 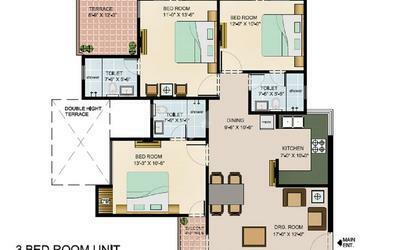 It offers spacious 3BHK, 4BHK and 5BHK apartments. The project is well equipped with all the amenities to facilitate the needs of the residents. R.C.C. Raft Foundation with anti termite treatment. Earthquake resistant R.C.C. framed structure with filler wall in brick work and internal portion in half brick work. Superior quality hard wood frame with decorative moulding of best quality matching with frame. Decorative veneer paneled door shutter with superior quality wood frame and moulding/beading matching with frame/paneling i/c EURO profile lock of best quality for security. Decorative veneer paneled door shutter with superior quality wood frame and moulding/beading matching with frame/paneling. Decorative glazed shutter with superior quality wood frame & moulding/beading matching with frame or scratch proof UPVC shutters with frame. Glazing in windows/ventilators etc. with coloured toughened glass of specified thickness. Stainless steel/CP brass fittings of superior make & quality with night latch. Standard SS section with glass and accessories. Living, Dining, Lobby Italian marble stone flooring with gorgeous look. Italian marble stone flooring matching with wall tiles. Stilt Area Granite stone flooring with decorative bends/borders. Basement Area Cement concrete pavement with hardener /M-30 interlocking paver block/ factory made RCC pavement slab. Designer Ceramic glazed tiles of superior quality of sufficient size upto ceiling height. Cement plaster followed with Birla/JK putty and then POP plaster of superior quality with decorative cornices and mouldings and finally finished with royal luxury plastic emulsion paint in elegant colour combinations. Cement plaster followed with Birla/JK putty finally finished with plastic emulsion paint and marble work in wall lining upto different levels in an elegant colour combination. Cement plaster/exposed RCC finally finished with white wash. Decorative lacquer polish in an elegant shade combination. Textured exterior paint/ Washed mosaic plaster/Acrylic smooth exterior paint. Providing of reception counter with sufficient sitting facility in stilt area in each block accessorized with communication network for all flats. THE BHAGWATI CO-OPERATIVE GROUP HOUSING SOCIETY LTD. The Bhagwati Co-Operative Group Housing Society Ltd. was formed by its promoters in the year 1983. The Society was registered with the office of Registrar Co-op Societies, Old Courts Building, Parliament Street, New Delhi-110001.on dated 22.12.1983. The Bhagwati Co-Operative Group housing Society Ltd. constitute of 300 members. The sole motive of the society is to make affordable houses for its valued members. The Bhagwati Co-Operative Group housing Society Ltd. has been allotted a piece of land, of 17001 sq.mt. in the most prime sector-22 of Dwarka sub-city by Delhi Development Authority in the year 2000. The plot is situated on 120 meter road heading to NH-8, Gurgaon and is in close proximity of Indira Gandhi International Air Port, 5 Star Hotel-Vedanta by Taj’ Delhi, Airport line Metro Station- Sector-21, proposed Bijwasan Railway Station & no of Embassies. The Society has appointed Architect M/s Imagination Prop. Mr. Vinay Goel & Contractor M/s Best Buildwell Pvt. Ltd. for execution of the Project. The Society proposes to construct 300 apartments for its members and 105 D/U for Economically Weaker Section (EWS). The Project shall constitute of 10 Towers ranging from 14 to 16 floors with (-2) level underground basement parking for more than 600 cars for its residents. The Project offers (4) categories of apartments to suit its members requirement and budget. i.e. 3 Bed Room, 4 Bed Room, 5 Bed Room & Duplex Pent-House with Terrace Gardens. The residents of this project shall be privileged to use walking Track, High end Fitness Gym, Cretch, Library and beautiful land scaped Gardens with water bodies. The residents shall also be provided 24X7 filtered water & power back- up in the apartments and common areas. The Society has received all the clearances & NOC’S from the competent authorities’ & the Construction work has commenced at site. The Society proposes to hand over the project to its members in (36) months.